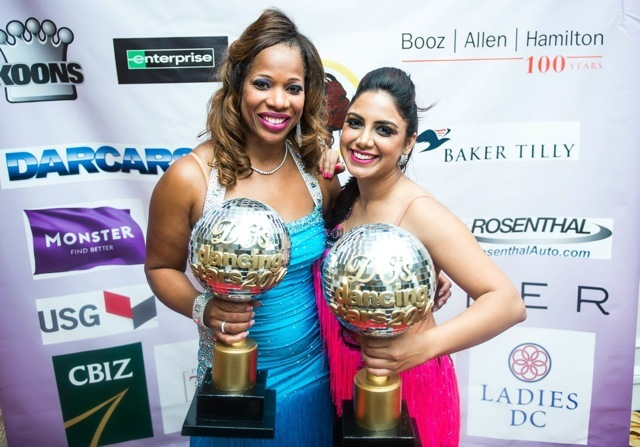 WUSA9 morning show anchors Mike Hydeck and Andrea Roane and PBS contributor Rina Shah competed in the first ever DC’s Dancing Stars Gala Saturday night at the Ritz Carlton in Tyson’s Corner. The evening, which raised more than $150,000 for local charities, brought together several former Washington NFL athletes and a crowd of more than 400 attendees. Modeled after ABC’s “Dancing with the Stars,” the competition was emceed by Clinton Portis and Chris Cooley, former Washington NFL players, who’s on stage chemistry bested that from any gala in recent memory. Hydeck, Roane, and Shah were joined in competition by “House of Cards” actor Lamont Easter, former NFL athlete John Booty, America’s Miss DC Sarah Hillware (2012) and Antoinette Cordova (2013), VP of DARCARS Automotive Group Tammy Darvish, and Ted Britt Automotive Group GM Evelyn Smallwood. In the end, “Dancing with the Stars” dancer Jonathan Roberts, “The Bachelorette’s” Chris Bukowski and former Washington NFL player Gary Clark awarded Charrisse Jackson-Jordan, wife of former Washington Wizards coach Eddie Jordan, and Shah the night’s champions, with Jackson-Jordan winning for highest votes and Shah named Judges’ Choice with the highest score. Participants were paired with dance professionals from Fred Astaire Studio of Fairfax, the night’s presenting sponsor. Studio owners Maria Coakley David and Jim David served as the night’s co-chairs, with Susannah Moss as executive director. Live auction hosts and former Washington NFL athletes Rick ‘Doc’ Walker and Brian Carpenter also awarded pre-competition participant Cindy Hardeman the Redskins Challenge winner and recognized Emily Lozano, who raised more than $10,000 for the night, as the fundraising challenge winner. The night’s philanthropic recipients included The Washington Humane Society, Girls Health Ed, T.A.P.S, Hope for Henry Foundation, The Parkinson Foundation of the National Capital Area, The Leukemia & Lymphoma Society, and The Washington Redskins Alumni.